Secluded, detached cottage with large gardens, situated on Frogmore Common. Sleeps 6 (2 Doubles, 1 Twin). Ample parking, Internet access, 10 minutes from Reynoldston Village (P.Office & pub/ restaurant). Sorry no pets or smoking. 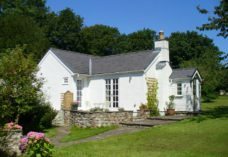 The Cottage nestles at the edge of Frogmore Common, at the foot of Cefn Bryn in a completely isolated location which is accessed by a single track. It is a perfect retreat for those seeking complete solitude; the closest neighbours being of a four-footed or winged variety. The Cottage stands in its own substantial landscaped gardens which are fully enclosed, so safe for children. There are three bedrooms; two rooms with a king size bed and a twin room with two single beds. Bed linen and towels are supplied for you, on arrival. The family bathroom has a bath, separate shower, hand basin and WC. An additional WC can be found on the ground floor. The fully fitted kitchen has an electric oven and grill, microwave, dishwasher, fridge and freezer. A washing machine and tumble dryer is located in the utility building that runs alongside the cottage. The utility room would be a suitable place to store surf boards or bicycles. Although there is a table and four chairs in the kitchen, there is also a dining room with a table and six chairs. The lounge exudes a cosy, cottage atmosphere and has a log-burning stove, comfortable seating, a TV and DVD player. WiFi Broadband is available throughout the property. The Cottage is only available to hire during the Summer. We are unable to accommodate pets or smokers and we would ask that our guests treat our home with respect. Have special requirements? Call Russell Davies on Mobile 07970 021977.